New custom-made twin wall braided loops, formed out of our proven Nano-mono material your fly line will go right up to the braided loop so minimising any hinging effect. With four sizes to choose from you can really match your fly line well - whatever the size. 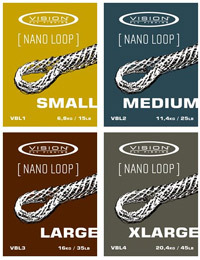 Far more compact than most out there, Nano Loops offer a very neat connection and wont jam in the rod rings. Small and Medium loops come with a pull-fit tubing, bigger Loops have Heat-shrink tubing. 4 loops per pack. For easy connection of fly line and leader we offer custom made braided loops. The stronger 40lb. versions can also be used to connect shooting heads. 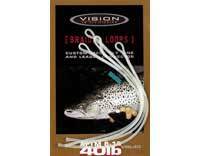 Vision loops have a fine braid for durability and best fit. For a perfect fit they come with two different ID sleeves. To ensure strength a drop of superglue is recommended.